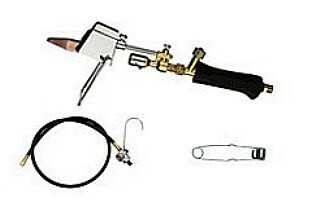 Propane Soldering Iron Kit, 13 oz Pointed Bit, 4 ft. Hose, Reg. PRODUCT: SIEVERT ESK2-04 SOLDERING IRON KIT, WITH #3486-47 SIEVERT PRO 86 HANDLE, 2955-01 SOLDERING BURNER, 7081-21 WIND SHIELD, STAND, #7020-70 13 OZ. POINTED COPPER BIT, #3015-04 4 FT. UL LISTED HOSE & REGULATOR, FLINT STRIKER. PRICE/KIT. . DESCRIPTION: KIT INCLUDES #3486-47 SIEVERT PRO 86 HANDLE, 2955-01 SOLDERING BURNER, 7081-21 WIND SHIELD, STAND, #7020-70 13 OZ. POINTED COPPER BIT, #3015-04 4' UL LISTED HOSE & REGULATOR, FLINT STRIKER. Sievert #7020-70, 13 oz. Copper Pointed Soldering Bit / Tip. For propane soldering with Sievert ES / PRO86 handles. Price/Each.